Now, where did I leave off ... Oh right. On Wednesday evening I escaped the confines of our hotel confinement and had dinner with Varen at Lekgotla in Sandton. And then it was Thursday. I found the second week of the course far more hectic and a lot more soul-destorying, as in: OMG I will never be able to do this, maybe I need a new career! Luckily we had a fabulous speaker, Amon Jack. I think he must be fabulous as a Personal Life Coach because he certainly impressed me after just one day. On Thursday evening we had our Last Dinner. We had a separate section of the dinning room and played our music, handed out awards and generally had a good time ... which deteriorated to the bar. It still wasn't an exceptionally late night, the course itself was exhausting. And finally it was Friday :) By this stage, as much as I had bonded with some of my fellow attendees, there were others that I was sincerely looking forward to seeing the back of! It seems funny, but you forget how much you appreciate being around people who already know you, accept you and like you. The day was a blur of exhaustion and ended with our graduation ceremony. Varen came to fetch me and whisked me away for a relaxing night of take-out pizza and dvds and lots of hugs :) It was just what I needed! Although I must comment that we tried the Il Capo's pizza in the East and it was not quite up to the standards of the one in the West. Due to the lack of elec (thanks Eskom) at his place, we ended up at his folks place watching our dvds: Fur (my choice) and Open Season (his) - don't ask, I know it appears we have vastly differing movie tasts, but usually we don't ... finding dvd's neither of us has watched is a truly tricky task tho! Fur: An Imaginary Portrait of Diane Arbus (also known simply as Fur) is a 2006 film starring Nicole Kidman as iconic American photographer Diane Arbus, who was known for her strange, disturbing images. She committed suicide in 1971. Fur was interesting, but unfortunately for my current state of mind (I was drained from a long week), a little slow and unfortunately had far too little of Robert Downey Jr for my liking ;) Otherwise it's an interesting arty movie - definitely not mainstream but interesting none the less. I'm certainly interested to find out more about Diane Arbus and her photographs after watching this. 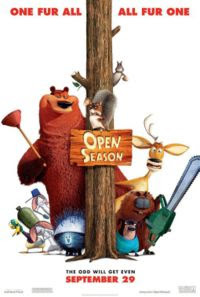 Boog (voiced by Martin Lawrence), a happily domesticated grizzly bear, has his perfect world turned upside down after he meets Elliot (voiced by Ashton Kutcher), a scrawny, fast-talking wild mule deer. Okay, I must admit this movie didn't interest me in the least and thankfully we watched it second as I fell asleep half way thru. It is your typical kiddie animated movie. Generally I'm not a huge animation fan, there are a couple I really liked (The Incredibles, Nemo) but more that I just didn't (Toy Story, Cars, Open Season). Saturday was a bit of a crazy day with plenty of driving and admin type stuff but, Varen & I did head to movies to watch Shrek 3 ... well, that was what we intended till we got there and saw the queues almost exclusively of tiny screaming people and their parents. Shrek was out in order to keep me sane - we'll try again soon, but definitely after their bedtime! So we saw Fantastic Four: Rise of the Silver Surfer instead. We had a quiet Saturday evening at home watching some House snuggled on the couch and again I fell asleep, this time in the third of fourth episode. It really was an exhausting week! Sunday we had a lazy morning and had a much needed late sleep-in. Then we went house-hunting. Varen has decided he needs to find a new place. At the moment he's in a fairly complicated living situation with his folks living in his brother's place while their house gets built and him living with his brothers in another temporary situation while his own apartment gets completed. But his apartment was bought when he still worked here with me, and now that he doesn't ... it makes his morning drive frightening, so he figured he'd start looking for somewhere more viable. And after that exhausting work-out we headed to Sakura for some much needed sushi! I was having withdrawal :) And we ended the evening off with another few episodes of House ... very relaxing :) And now here I am back at work struggling to catch-up after a week away ... which is the reason for this very late post ;) Here's looking forward to a more relaxed week ahead - finger's crossed! Although apparently the time has come to meet Varen's inst-group of friends for real at dinner tomorrow night ... yikes!